Learn more about this common dental problem affecting millions of Americans. Complications impacting the health of your gums. Common symptoms of periodontal disease include unhealthy receding gums that are red and inflamed. Occasionally this can lead to sensitivity and bleeding. As the disease advances, it destroys your supporting bone, which leads to teeth shifting and eventually falling out. Gingivitis and periodontitis are the most common diseases that affect your gum health. Both are caused by plaque buildup and lead to inflamed lesions in the mouth. Gingivitis appears first and is less serious but can lead to periodontitis. The primary cause of periodontal disease is when the bacteria in dental plaque starts to irritate your gums. Some people are more susceptible to gum disease due to their genetic makeup, but anyone can suffer from it. The most common reason for plaque is poor oral hygiene, allowing for calculus to occur above or below the gum line. Did you know 80% of Americans will be affected by periodontal disease by age 45, and 4 out of 5 patients with the disease are unaware they have it? This is because the early stages of gum disease can be painless and show no symptoms, which is another supporting reason for a thorough daily brushing and flossing routine. Take the first step to keeping your gums and teeth healthy. Prevention is the greatest cure when it comes to periodontal disease. Once you have the disease, all our experts can do is help maintain it and stop it from progressing. It has the potential to flare up and cause future problems. Daily brushing and flossing is the most effective way to prevent periodontal disease, but even with diligent care, you may still be at risk. Dr. Pasquinelli and Dr. Olivares work with you to achieve optimal brushing and flossing techniques. They also outline what habits may put you at greater risk such as tobacco usage, stress, or poor nutrition. It is important to note that if you suffer from periodontal disease symptoms you must contact a dental professional. Both dentists and periodontists have the skill and knowledge to stop gum disease, so please don’t delay getting in touch. Here is some advice from Dr. Pasquinelli and Dr. Olivares on how to keep your smile in good shape. Our team of periodontal experts is perfectly placed to give you and your family helpful guidance on gum health. Through a solid hygiene routine, you can significantly reduce the risk of gum disease and safeguard your overall health. Tooth brushing is a vital defense against periodontal issues and cavities. Here are some top tips from your caring dentists in San Francisco. Position the toothbrush at a 45-degree angle and brush in a circular motion where your tooth meets your gums. Apply some pressure but be sure to brush gently and not too hard so it hurts. When brushing the inside of your teeth, hold the brush vertically and gently move the head back and forth. Make sure you brush around the gums too. Adjust the position of the toothbrush to cover all the areas. Use a short, gentle technique and then rinse your mouth to remove any debris. Flossing is an effective way to protect your gums against periodontal disease. Floss can reach areas between your teeth that brushing alone cannot. Choose your floss and then wrap each end around your middle fingers. When cleaning the upper teeth, use your forefinger and thumb to grip the floss. Then utilize a gentle back and forth motion between each tooth. Be sure to hold it tightly against the side of your tooth and move it up and down – as if to clean the tooth. Floss both sides of each tooth including those right at the back! Insert the floss between the teeth using your forefingers on both hands to move the floss back-and-forth. Practice the same cleaning technique as the upper teeth and remember to be gentle. You may experience some bleeding when you first begin flossing regularly but this should stop after the plaque has been removed. Once you are finished, simply rinse your mouth to remove any debris. If your teeth become sensitive to cold and hot food or drinks, you may need to treat them with a little more care. Tooth sensitivity is normally caused by poor hygiene and can be helped with medicated toothpaste or mouth rinse. Dr. Pasquinelli and Dr. Olivares will check for any other causes of tooth sensitivity during your regular checkup. Electric Toothbrush – these are proven to reduce plaque build-up and help with your efficiency of brushing. When used in conjunction with flossing they produce fantastic results. Fluoride Products – these toothpaste and mouth rinses can reduce tooth decay by up to 40% if they are used when brushing and flossing every day. Anti-Plaque Rinses – when used alongside brushing and flossing, these help control early signs of gum disease. Only use those that are American Dental Association approved. The staff was very professional and Kirk was extremely thorough. He exceeded my expectations completely and has left me with an incredible smile. Removing damaging bacteria from your teeth. After your comprehensive exam, Dr. Pasquinelli or Dr. Olivares may recommend scaling and root planing. These non-surgical procedures are used to remove harmful agents such as plaque and tartar from your teeth. Scaling removes plaque and tartar that has formed on the tooth surface and the gum line, especially around the tooth root. The process involves an ultrasonic scaling tool and includes an antimicrobial spray to reduce oral bacteria. Root planing involves removing unwanted microorganisms and toxins that are affecting the inside of your tooth or the root. The bacteria is removed by smoothing out your tooth’s root to promote healing. This also prevents future bacterial buildup. There are many benefits to scaling and root planing. This procedure helps reduce the buildup of bacteria, which can affect the health of your heart and respiratory systems. It also protects you from tooth loss and the common effects of periodontal disease e.g. bad breath, stains, and pain. 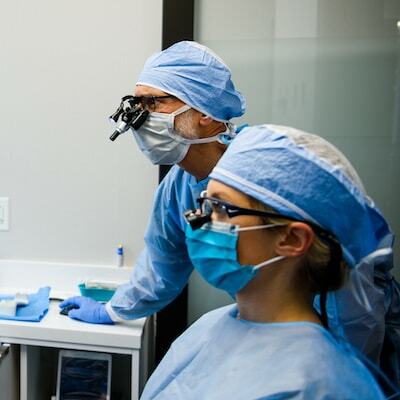 We offer a comprehensive approach to periodontics in San Francisco. Experience the benefits of proper periodontal care with SF Perio & Implants.